Last edited by asynartetic; 06-15-2016 at 07:19 AM. Charismatic? Check. Outgoing? Double check. You have more friends than you can count but remember all of their names because that’s how you roll. You may be accused of being braggadocios but who cares since you can back it up. 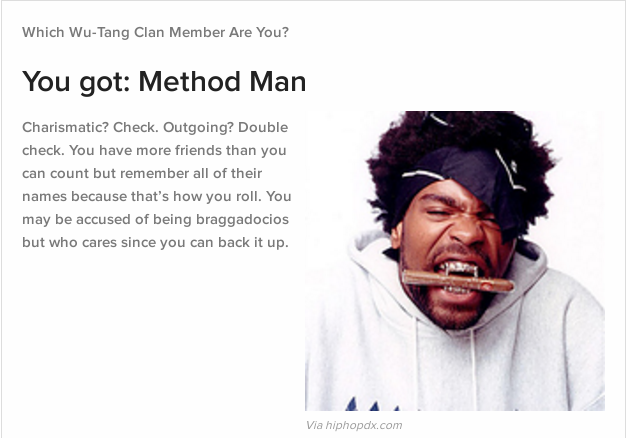 You are the flyest of your friends and aren’t afraid to remind them of that fact. You are the type of person who walks into a room and everyone is like, “DAAAAMN! Who is that?” You are also a not-so-secret nerd, which just adds to your cool factor. 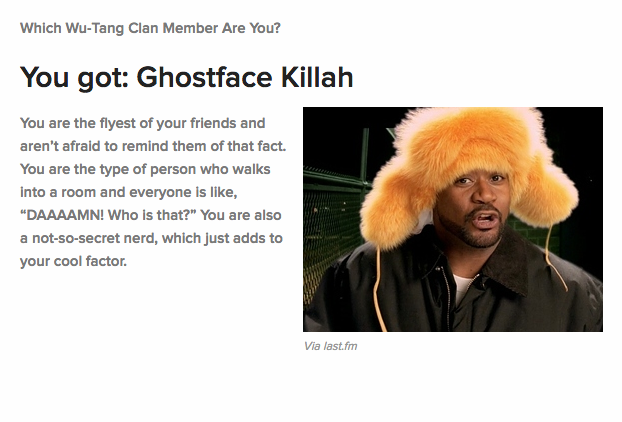 I got ghostface, but was expecting ODB. I heard he was an INFJ, however that works. You are enigmatic at times and usually the smartest person in the room. Your opinion matters to those around you and is well respected by those who aren’t. You are also extremely driven and continually look for opportunities to expand your horizons.